Krishnendu from Agartala, B.E. - B.Tech Graduate. SHAREPOINT 2007 SHAREPOINT 2010/2013.. VBA EXCEL & ACCESS) AND.. BOOT STRAP NINTEX INFOPATH FORMS DCF CALCULATIONS RATIO ANALYSIS INCLU.. RESEARCH & ANALYSIS ..
are one of expert skill area's of Krishnendu . 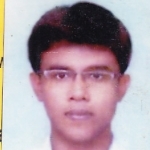 Krishnendu is working in IT Software industry.